Pte Derby, the official mascot of the Mercian Regiment, has been handed a promotion. The pedigree Swaredale ram, who was donated by the Chatsworth Estate, was made a Lance Corporal during a Crimean War ceremony at Nottingham Castle. The Ministry of Defence said his new rank was a reward for "good behaviour". 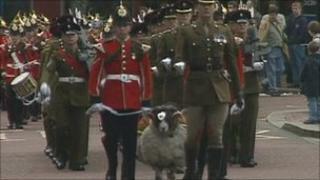 The Mercian Regiment and its predecessor, the Worcestershire and Sherwood Foresters, has used a ram as its mascot since 1858. L/Cpl Derby, the 29th ram to be used, takes part in military ceremonies and parades and has his own identification number and Army rations. The current ram has been with the regiment since 2008 and is one of only five mascots paid for by the government.